Spring in Asia is marvelous — depending on where you choose to travel, of course. Numerous spring festivals in Asia celebrate the end of winter and coming of warmer days. The weather can be especially enjoyable in East Asia where flowers and blooming fruit trees are mindfully appreciated. On the other hand, many destinations in Southeast Asia become unbearably hot as the rainy season approaches. April is usually the hottest month in Thailand; maybe that's why getting buckets of cold water dumped over one's head during the Songkran festival (traditional Thai New Year) doesn't sound so bad! Note: Traditionally, Lunar New Year celebrations such as Tet and Chinese New Year (January or February) are considered the beginning of spring — but temperatures suggest otherwise! The definition of spring varies between cultures, but since most of Asia is in the Northern Hemisphere, "spring" here refers to traveling during March, April, and May. As temperatures get hotter and hotter in spring, fires burn out of control in Northern Thailand. These forest fires are mostly caused by illegal slash-and-burn agriculture methods. Air quality becomes a big concern in popular tourist places such as Pai and Chiang Mai. Particulate matter in the haze reaches dangerous levels. Some residents flee to southern destinations, meanwhile, everyone else has to wear a mask while outside. If you suffer from asthma or other respiratory problems, check conditions before traveling to Thailand, Laos, or Burma in March and April. With the exception of Indonesia, Brunei, and East Timor, spring is the hottest time to travel in Southeast Asia. Temperatures reach their peaks for the year in April and May, however, they remain fairly consistent in Bali throughout the year. As monsoon season builds in May and showers become increasingly frequent, the humidity is stifling. Expect intermittent cloudbursts in late spring. The dry season in Indonesia begins in late spring. If you don’t mind the potential for sporadic rain, spring can be a great time to sneak into popular places such as Bali before the crowds fully arrive for the peak summer season in June and July. Expect to take at least two showers a day if not more! You'll definitely want a clean top for evenings after sweating all day, so bring double or plan to purchase more. Pack for rain in April and May. Songkran: The traditional Thai New Year celebration is widely considered the largest water fight in the world. Songkran officially begins on April 13 each year, but people start celebrating early — watch out for that phone and passport! The epicenter for Songkran is in Chiang Mai in Northern Thailand. Easter: The Philippines, Southeast Asia's predominantly Catholic country, celebrates Holy Week. During this time, many local businesses are closed and streets get blocked; plan accordingly. Nyepi: The Balinese Day of Silence shuts the island down completely in March. Even the airport is closed. Tourists have to remain inside their hotels for the day. Reunification Day in Vietnam: April 30 is celebrated throughout Vietnam as the day that Saigon was captured and the country reunited. The hustle and bustle of Beijing is far more tolerable in the spring before pollution traps summer heat in the city. Green, rural places such as Yunnan are perfect for fresh air and pleasant temperatures before June. Japan comes alive with spring flowers and blooming cherry trees. Big crowds go to the parks to picnic and enjoy the beauty — you should do the same! Pack layers! Temperature swings are common as winter gives way to spring. You'll want reliable rain gear if traveling to Hong Kong, Shanghai, or Japan. These spring events are big enough to affect the region. Plan ahead by booking transportation and accommodation earlier than usual. Hanami: Japan’s Cherry Blossom Festival begins in the south around March and concludes in the north around May. The fleeting blooms are a great excuse for everyone to picnic and party in the parks. Golden Week: The biggest holiday period in Japan begins on April 29 with Showa Day and winds down after May 5. Golden Week is the busiest time of year to travel in Japan! International Labor Day: May 1 is celebrated as Labor Day in China. Although not as intense as National Day on October 1, millions of Chinese people will be traveling. Just as hanami winds down, Golden Week — Japan’s busiest travel time — begins on April 29 and goes through the first week of May. Several national holidays coincide to produce an insanely busy time. The peak tourist season begins in May, shortly after. Although Golden Week is exciting, accommodation prices skyrocket, and you'll have to wait way longer in queues than usual. Consider waiting an extra week or two before visiting Japan. Per the Hindu calendar, spring (Vasant Ritu) begins in India in February and ends in April. The monsoon season in India typically begins in early June and lasts until October. Excessive heat and humidity become suffocating in some places around India. Temperatures can hover around 105 degrees Fahrenheit in April! If you aren't a fan of extreme heat, steer clear. Pack for extreme temperatures. Take plenty of extra tops or plan to buy additional clothing there. Rain isn't a problem until the monsoon hits Delhi hard in July. Holi: India's crazy Festival of Colors sometimes occurs in March. Dates change annually; you'll definitely want to be ready! Carnival in Goa: The Portuguese brought Carnival to Goa, and it is still celebrated with gusto the week before Lent. With so much religious and ethnic diversity around the subcontinent, India has numerous other smaller festivals in the spring. Along with extreme temperatures for Delhi in May, the air quality can often be very poor. Without rain to remove some of the pollution, the suffocating urban heat and particulate matter can cause travelers to become heat exhausted while exploring. 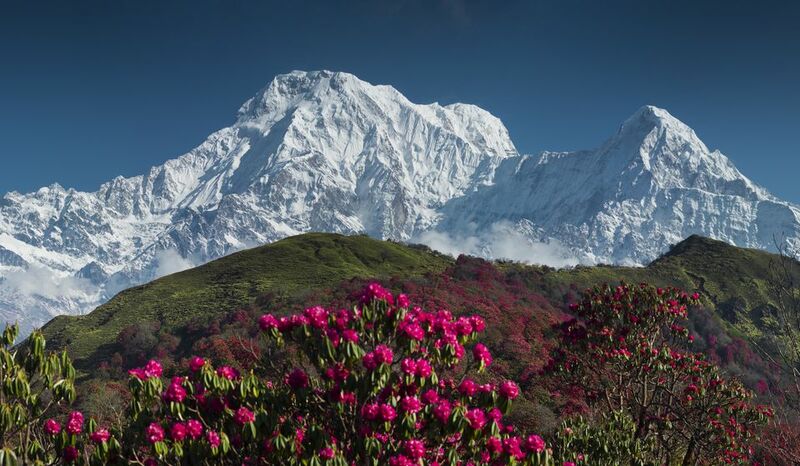 Spring is the best season for visiting Nepal. Wildflowers bloom and trekking opportunities abound. Climbing season begins on Everest, so spring is a great time to do the trek to Everest Base Camp. Spring usually provides the best views of the tallest peaks in the world before summer humidity limits visibility. May is a good time to hit the peaks.